What did you do this past weekend? Did you happen to go to Paris? Did you happen to have a highly intuitive, somewhat sassy and clever kitty as your tour guide? No? So sorry to hear that, you must plan your trip to Paris with George as your tour guide NOW. I just returned. My trip was a whirlwind excursion all through the eyes of George. George cannot type you know due to the one thing that cat's lack (thumbs) but author David Stone (who is George's "man") told us George's story brilliantly. Deborah Julian's ("the woman") charming and delightful illustrations were completely captivating. George and Billy are New York City apartment cats. Their world consists of window views, litter boxes, food served at the exact same time every day, toys and the love of their "man" and "woman" (as is the case with so many indoor cats). One day while observing a pigeon outside their window George thinks "if birds can go out and do whatever they want, why are cats kept confined? Are the birds better than us? Are they more capable?" it turns out the answer is an overwhelming NO! George is bored with his inside existence and wants to see the world! He doesn't care about the destination because all destinations lead to "outside!" He is resentful when his "man" and "woman" leave for various vacations (he always knows when they are going when he sees the giant suitcase appear on the bed and hears the "zip, zip, zip" of the zipper opening and watches the clothes being piled in). George vows that next time he will devise a plan where he can join them and "devise a plan" he did! Even "copycat" Billy who follows and mimics George's every move (much to George's annoyance) got in on the plan!! I won't spoil the fun and say how George carried out his plan but it got he and Billy to PARIS!! "Paris is the world and the universe" "There are flowers on every corner." George takes us on a delightful tour of Paris, teaches us it's history full of richness and Art (once again Deborah Julian's illustrations make this journey even more delightful!!) Museums, parks, flowers, food, of course the Eiffel Tower.....ahhhh Paris! Even insecure baby brother Billy begins to relax and "live in the moment" which cats seem to do so well but their humans seem to lack this ability which is wisely and duly noted by George. George and Billy even seem to grow closer on this shared journey. George lives by the mantra of "if you wish for great things you must learn patience" He goes on to say "still, when my golden opportunity does arrive, I am ready for it, and I execute my plan with artistry and stealth. What an adventure I have ahead!" 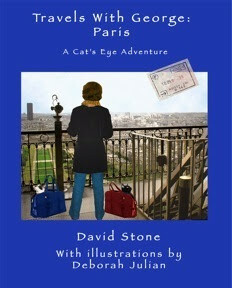 What an adventure YOU will have ahead when you read "Travels With George:Paris, A Cat's Eye Adventure" Grab a croissant and your favorite beverage and allow George to give you a most historical and insightful tour of Paris (as only a wise cat like George can) Allow him to show you how to "live in the moment", "how to be happier from now on. We'd all be much happier if we all absorbed a little more like a cat"
A Paris tour through George's eyes sounds really interesting. Oh PARIS!!! Thanks for recommending this book to us, Caren! Ohhh yes Priscilla it was so interesting! You are most welcome! Thanks for reading and for commenting! That sounds like a good read. Thanks for suggesting it. I'll get on M to pick up the book. Hi Mario! I think it was very good and with you being a "boy kitty" who probably likes adventure I think you will love it and "M" will too! Thanks for stopping by and reading Mario! Great review, Caren! I loved this book, too - the combination of David's writing and Deborah's illustrations, along with the lovable George and Billy, make this a wonderful read for cat lovers. Lisa thank you so very, very much! Your kind words mean so much!! Thank you for your continued support from the very beginning! Your kindness and friendship have meant the world to me! Now I can go and look up your review! I had David scheduled on my blog calendar when your review of the book was done and I didn't want to read yours before I read the book (I am very strange that way) I don't want anyone else's opinions or observations to come into play when I write a review. Thanks so much for reading/commenting! Ohhhh yes it is!! I want to travel with him as well!! Inigo Flufflebum and d'Artagnan Rumblepurr-noooo tuna is bad for kitties....salmon croquettes!!!! MOL! Sounds like a heck of a read if only for the atmosphere! Ann, I know! I had a "sudden" urge to go to Paris too when I read it. If you read it I am sure you will like it! Thanks for commenting! Life With Dogs, lol! yes I guess a dog would rather just read it than to worry about the cat aspect lol! Thanks for visiting and for commenting! Hi Lautrec and Tiny (Lautrec sounds French as well!) I hope your mom will be able to read the book to you I am sure you will like it! I am so glad that you and Tiny stopped by! Cody's head looks the best it has looked in a few weeks it is almost all cleared up, thanks for asking! He is still on antibiotics so the test will be when he comes off of them and is just eating the rabbit, then maybe the rabbit worked! Thanks for visiting and for commenting! Thank you all for your comments on behalf of both Deborah and me, and thank you, Caren, for your insightful review. This book was a labor of love, as Deborah and I both love cats and Paris. It was great fun channeling a cat's point of view. Deborah has a lot of cat art and other work on her website: http://DeborahJulian.Myshopify.com. Stop by. Sign up for our monthly newsletter. Dave it was completely and totally my pleasure! I thank you for your kind words! I could feel the love throughout the entire book and to me that is an important feeling for me to feel while I am reading. Your love of Paris was obvious, your love for cats and amazing grasp of how we believe that cats think, for me was right on target. I told you I honestly thought it was a true story until I saw "fiction!" It was so believable to me. I so distinctly felt the different personalities in George and Billy and I loved that. I will stop by Deborah's site again and I am fairly certain I already signed up for the newsletter, if not I definitely will! Thanks again for allowing me to blog about your wonderful book!